Otherwise, some of the issue types won't be available to use. See Configuring initiatives and other hierarchy levels for more details. Also, note that the default duration for issues would depend on the timeframe in which you're viewing the plan. You can always edit the duration after the issue is created. Fit: The default duration depends on the date range of the issues in the timeline, which affects the width of the issues in the timeline. If the width fit is small, then the default duration could perhaps be a week or a month. A plan typically contains issues coming from multiple issue sources, such as boards, projects, or filters. As a best practice, it would help you plan work and create issues more efficiently if you keep in mind the issue source, and the parent issue of the issue you're creating. This helps you create child issues of issues across multiple issue sources, where it makes most sense. In the scope section of your plan, go to the parent issue for the issue you want to create. 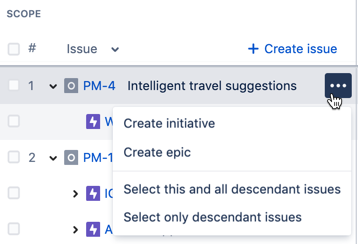 Hover on the parent issue > click + > select the hierarchy level for the issue you're creating. This will add a row for the new issue, right below the parent issue. In the new row, select the issue type for the new issue > select the corresponding project. Note that the chosen project will be selected by default the next time you create an issue. You can update the project as needed. Give the new issue a name, then click Enter. If already known, specify other issue details, like assignee, team, estimate, sprint, release, and target dates. 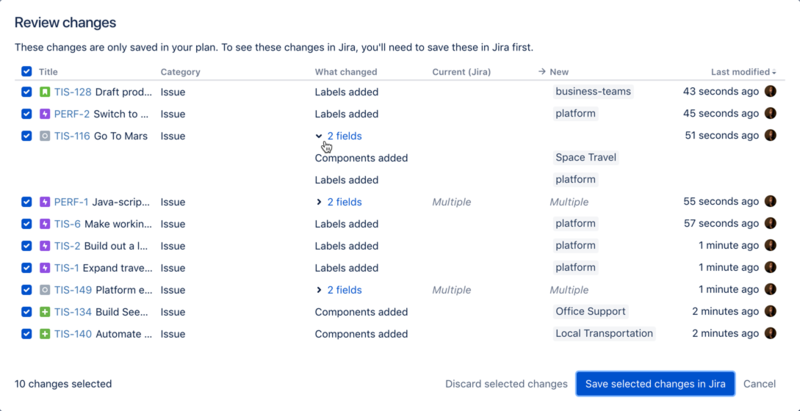 You need the Portfolio for Jira user permission to save changes in Jira. You can also create a sibling issue — sibling issues are issues of the same hierarchy level. In the scope section of your plan, find an issue of the same hierarchy level of the sibling issue you want to create. Hover on the issue > click + > select the same hierarchy level. This will add a row for the new issue, right below the issue you'd referenced. In the new row, select the corresponding project. If you're planning high-level work and just want to create issues fast, you can choose to create issues at any hierarchy level. This is helpful for when you have some issues to create, but you can't connect these to parent issues just yet. In the scope section of your plan, click + Create issue. Select the hierarchy level for the issue. This will create a new issue at the bottom of the scope section, along with other issues that don't have parent issues. Give the new issue a name, and click Enter. 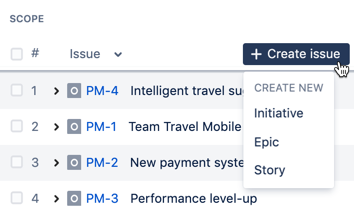 When creating an issue at any hierarchy level, both the project and issue type of the previously created issue will be used by default. You can update these details as needed.